Why are police arming for war in a time of relative safety? The rural county (population 24,042) obtained the 20-ton, $733,000 armored vehicle for free from the Pentagon as part of a program to funnel unused war materials to local police. Thomas tells NPR that although some citizens are uneasy about it, “What most people don't understand is that an MRAP is nothing but a truck with a big bulletproof box on it.… There is no offensive capability.” But his requisitions are not all so defensive: a database compiled by the New York Times shows that Page County has also acquired an arsenal of 27 military assault rifles in the last eight years. Although this sentiment may have originated among the sheriffs and SWAT teams loading up on military hardware, the assumption that officer safety requires this kind of “overkill” has become quite widespread. But an in-depth look at the numbers fails to substantiate these arguments. Officer fatalities have been declining for decades, both in absolute terms and adjusted for population. According to the National Law Enforcement Officers Memorial Fund, which maintains “the largest, most comprehensive database of line-of-duty officer deaths,” 2013 had the fewest officer fatalities, at just 100 deaths, of any year since World War II. The 31 firearms-related deaths were the fewest since 1887, while traffic incidents, with 43 deaths, were the leading cause of fatal injury. Between 1992 and 2013, officer fatalities fell by over a third, but fatalities relative to the size of the population being policed show an even steeper decline. Over the same time, according to NLEOMF and Census Bureau data, officer fatalities per 100,000 residents fell by an astounding 50 percent. Although 2014 will likely see an increase in fatalities over last year’s record low, it will be well within the downward trend of the last several decades. Law enforcement fatalities and murders relative to the size of the total police force are also on the decline, based on the FBI’s Uniform Crime Reports, which track the number of felony killings of police each year, and the Bureau of Justice Statistics’ census of state and local law enforcement. Between 1992 and 2008 (the last year for which BJS numbers are available), police fatalities per 100,000 full-time sworn officers fell by over 27 percent, while homicides per 100,000 fell by 49 percent. Nor are fatalities falling only because of better medical treatment. 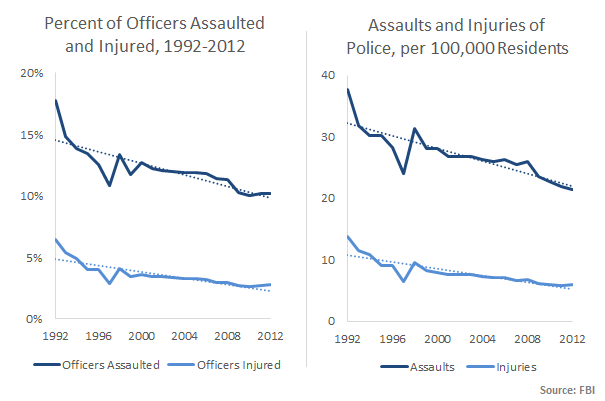 Although quality emergency care surely had an impact, all assaults and injuries suffered by police are down as well. According to the FBI’s annual report Law Enforcement Officers Killed and Assaulted, the percentage of officers assaulted each year declined by 43 percent in the last two decades, down from nearly 18 percent in 1992 to just over 10 percent in 2012. Over the same period, the percentage of officers injured by assault declined by over half, from 6.5 percent to 2.8 percent. Police are not just being saved more often—they are also being attacked less frequently. None of this should be very surprising. 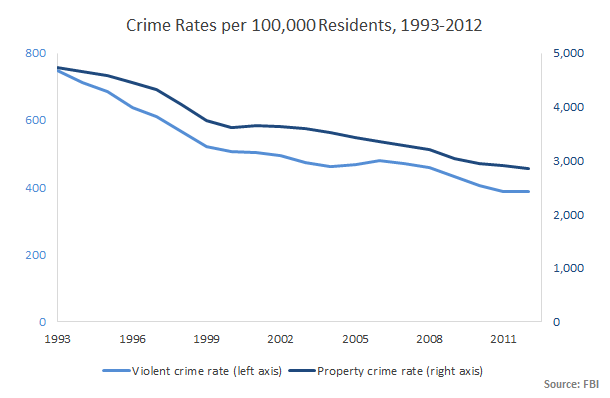 Workplace safety for police officers is directly linked to crime rates, and crime (contrary to popular belief) has been declining for decades. Since 1993, FBI data show that violent crime has fallen by 48 percent, and the murder rate is down by over half. Property crimes, such as burglary and auto theft, are down by nearly 40 percent. Moreover, the United States also has more law enforcement per capita than at any other time in its history. BJS census data show that between 1992 and 2008, the number of full-time sworn officers increased by 25 percent, while the U.S. population grew by only 18.5 percent. In 2008, there was one police officer with general arrest powers for every 400 American residents. Since then, while no definitive data exist, the NLEOMF estimates that the number of sworn officers has increased to more than 900,000—the highest figure ever. No one should think that police officers have an easy job. It involves daily interactions with belligerent suspects, intoxicated drivers, and reluctant witnesses. It is often difficult, sometimes injurious, and occasionally deadly work—but far less so than many common professions, such as fisherman, garbage collector, or truck driver. A tough job is not grounds for turning peace officers into a standing army. A tough job is exactly what cops have been hired to do. Police officers’ first responsibility is not to protect themselves at any cost but to run certain risks in order to keep citizens safe while protecting their rights. Defending officers is a laudable secondary goal, but police cannot arm and armor themselves in a way that hurts their primary objective: catching criminals and protecting civil liberties. Militarized equipment, tactics, and training put police on a war footing, leading to excessive force, alienating the community, and eroding public confidence in the law. No one is better off with such an outcome. But disproportionate fears about officer safety are leading inexorably to the disproportionate use of force seen on American city streets, from Ferguson to Los Angeles to New York. And, thanks to government policies subsidizing that kind of response, it could happen almost anywhere. The reality is that there are more police than ever, and they are safer than ever, in almost every way we can measure. There is less crime and violence for them to combat, and commensurately fewer assaults and injuries suffered by police. The unprecedented force and weaponry being displayed by cops today are not justified by the facts about officer safety. It’s time to demilitarize the police and return them to their proper role as members of the community, charged to keep the peace. Update: The graphs have been updated for clarity and to correct a decimal point error in the scale displayed on the first graph.